Foster + Partners have collaborated with London landscape architecture firm Exterior Architecture and urban planners Space Syntax in developing a proposal for an extensive system of elevated-bike paths in London. The project entails the construction of over 130 miles of pathways along routes that parallel those of an existing system of rail lines that already weaves in and around the city. Suspended above the train tracks, cyclists would access SkyCycle through the over 200 hydraulic platforms and ramps that would act as entry points. While somewhat evocative of New York’s own High Line, the precedent for the project actually goes back much further. 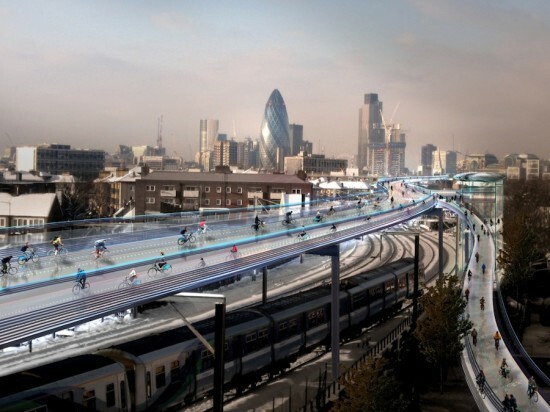 As illustrated in the accompanying promotional video, the project would essentially segregate cyclists from their fellow residents navigating London in cars or by foot. The move comes on the heels of a spate of cycling-related deaths that plagued the city last year. Foster himself is an avid cyclist and the current president of Britain’s National Byway Trust. London bikers will have to bide their time before taking to the air, however. If the proposal is to be realized, there are many hoops to jump through, including fundraising. SkyCycle would likely be completed sometime after 2030. While the use of the rail corridors has been framed as a cost-saving measure, estimates for an upcoming 4 mile trial route place costs at £220 million.